Although simplicity is the hallmark of modern cloud collaboration software, the decision to implement collaboration software in the company is not to be taken lightly. This seriousness is apt given the strategic nature of collaboration technology – while most software are used by some of the people in the organization some of the time, collaboration software is by used by most of the people (if not all) much of the time (and extends to partners and clients). Collaboration (or working together) is at the heart of what every organization does, and collaboration software can be thought of as the lubricant which ensures that the cogs and gears of business run smoothly. Just as the foundation of a building determines the strength of the super structure, the rigor and diligence with which collaboration software is implemented goes a long way to determine the success of the initiative. Study needs and define objectives – The first question to ask is – what are you looking to accomplish? – Organize documents and enable remote access? Enable travelling teams with mobile email? Centralize corporate information and processes in an intranet? Once the objectives are defined, the picture becomes clearer – what data, systems and people will be involved. Objectives become the guiding light for everything that follows. When objectives are unclearly defined – “to enhance company collaboration” – the initiative tends to meander. o Configuration – What will the structure of the solution be, what members will be assigned to each group, the level of access for different members and other policy controls. o Implementation Phases – Rather than throwing the collaboration kitchen sink at the organization, a phased approach to implementation ensures that collaboration tools are smoothly incorporated into company processes. Moreover, collaboration tools one at a time are easier for users to digest than having to learn the entire solution all at once. The sequence of tools implemented can be based on the priorities of the business needs addressed. 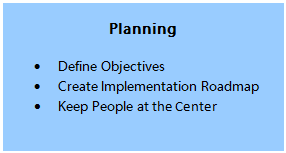 People – People are critical to implementation success. You need to identify all the stakeholders, persons responsible for implementation and use, and identify “champions” within specific groups who drive adoption. Careful migration – Migration is an extremely important part of the implementation. You will likely be moving hundreds if not thousands of email accounts from a legacy system, or terabytes of documents from individual computers or network drives. A migration conducted hastily could result in disaster like data loss, or cause problems which surface only much later. A careful analysis needs to be done of the data involved, the source and the target systems, and all possible interactions. 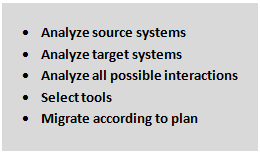 Based on that appropriate tools need to be selected and migration conducted according to a set plan. Training – The simplicity of use of collaboration software does not undermine the importance of training. The people who lead the collaboration software initiative sometimes tend to make wrong assumptions about end users. What may be glaringly self-obvious to you may not be so to others – some people DO NOT have what you would define as “basic” tech savvy. Plus, don’t underestimate the tendency to resist change. Training does not have to be simply about educating about product features. It is a great opportunity to get user buy in. Lay out the benefits of the system, and explain how it will help employees do their day to day work better. Separate trainings need to be conducted for administrators and users given different degrees of engagement with the software. Management backing: The management needs to send out strong messages about the importance of collaboration software to the organization and lead by example. Lay out formal processes: Lay out formal procedures for data handling which make the collaboration software part of the process. Marketing campaign: Implementation should be accompanied with an internal “marketing campaign” of sorts. Reward good behaviour: Reinforce positive behaviour with recognition, praise or material rewards. Once the implementation is undertaken with this seriousness, the collaboration initiative will surely soar on its own with minimal interference. Given the payoff, it makes sense to involve an expert in the process who can guide the implementation. For companies that may require such assistance, HyperOffice offers a variety of professional services ranging from consulting, migration, training and customization.